Will Scarlet, Robin Hood, John Little and Much are bandmates who steal from the rich to give to the poor so that they don’t starve and are able to cover heavy taxation fees. 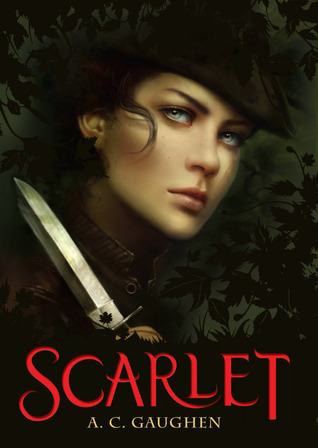 On the run from her past, Scarlet is posing as a boy whose life is threatened when the town’s sheriff assign Lord Gisbourne, from Scarlet’s past, to find Robin Hood and his band. One of the townie betrays them and Gisbourne ends up arresting Robin who saves Scarlet’s life. It is revealed that Scarlet is actually Lady Marian Fitzwalter, younger daughter of Lord Leaford, Gisbourne’s fiancé. Rob is flabbergasted. The next day they plan to rescue the townies taken in because they were unable to pay tax. In the chaos, Gisbourne catches Scar but Rob saves her and is taken as prisoner to be hanged. Scarlet marries Gisbourne so that he’d let Rob go free. Right after the ceremony, Scarlet tries to run away. An epic fight ensues where the sheriff dies and Gisbourne flees the scene. Rob is free but badly wounded. Scarlet tend to his wounds after which they kiss, make up, and cuddle. Will Scarlet, an informant’s in Robin Hood’s band, arrives in Edwinstowe in a small room in the back of Tuck’s bar with information about Freddy Cooper’s arrest because of a lack of tax payment and news that Nottingham is bringing in a Thief Taker from London to catch the Hood AKA Rob. Rob is the rightful Earl of Nottingham but when Prince John named his father a traitor after his death, Rob lost his position as he was away on Crusade on King Richard’s call. Unable to defend his name, Prince John gave over the position to the town sheriff who taxes the townies heavily and starve them. Anyway, they decide that John and Scarlet will break into prison at midnight and rescue Freddy Cooper and hide his family so that the sheriff can’t get to them. Scarlet has a habit of stealing food from bakers and give it to the poor people of town. I love her already. And oh, she’s a girl posing as a boy and only a select know this. Brownies points there. At midnight, John and Scarlet go to the Nottingham Castle where the prison is located. Scarlet climbs the rocky wall, goes inside from a secret tunnel entrance and rescues Freddy all on her own because she’s a fearless badass. On their way back, Scarlet hears Lord Gisbourne’s voice and her blood runs cold because he’s the newly appointed Thief Taker. He’s pretty heavily involved in Scarlet’s dark past and now that he’s after The Hood, it means that he’s after her. Gisbourne is an ugly man with greasy hair always falling around his face. Also, he doesn’t even do it for the money and likes to slit the throats of thieves instead of turning them in. Ew. So they deposit Freddy in Worksop, another small town near Nottingham, at Much’s father’s house. Scar gets to know that Gisbourne’s effects are coming in disguised at dawn and she finds Leaford’s ring in it and the band guesses that she knows more about him than she’s letting on. Scarlet gets sick and Rob gets angry at her that she hasn’t been eating as much. John starts developing a thing for her. The band steals a big crest of jewels which would be enough to cover Nottingham’s population. However, it gets stolen. Jenny Percy kisses Scar on the lips and it’s all kinds of hilarious. Gisbourne announces that he’ll kill anyone who helps the Hood and is about to slit the throat of one when Rob injures him. The guards then chase the band into the forest, Scar kills one and they end up burning down Major Oak which was like a home to the band. The band starts living in the cave. Godfrey Mason reveals the band’s camp location to Edward Marshal of Edwinstowe who informs Gisbourne. Rob is shocked because he trusted Godfrey. Godfrey shows up at Tuck’s and receives a beating. He admist that Gisbourne threatened to throw him in prison so he had to tell. Also, he wants to be marshal because his parents are marrying off Ravenna, his twin sister, to a Frenchman. Furious, the sheriff throws Godfrey and Ravenna in prison and intends to hang them. Scar and the band breaks into prison at night to make them think that they tried to free the twins but failed so that they can get them out for real the next day. The next day they free Godfrey and a few other prisoners. Ravenna refuses to come as she intends to marry the sheriff. Scar spends the day in Worksop. She’s at Lena’s inn when the guards come for tax collection and tries to burn the inn. Scar saves her inn and rescues the horses from the burning stable. Rob gives Lena money for the inn. It turns out all of it was for naught when the band sees Lena about to be hanged anyway. However, the sheriff announces that he intends to marry Ravenna Mason in a month’s time and let the prisoners go free after destroying their livelihoods. That night Gisbourne and a dozen of his guards arrive at Tuck’s claiming that he knows the Hood is present there. Gisbourne slits a child’s throat and goes after Much, Scar throws a knife which slits Gisbourne’s forearm and gives Much the leeway he needs to escape. However, Gisbourne and the guards immediately go after Scarlet and an arrow hits her on the shoulder. She climbs the trees and stay there until they go away. Rob asks Scarlet what happened to her in the past and she admits that she let Rob catch him stealing from him so that she’d be hanged. She and her sister, Joanna, fled their home but her sister got sick so Scar started stealing. Joanna died anyway and Scar left her in their rented room. She also tells him that Gisbourne gave her the scar on her cheek. The band keeps working the roads to collect coins. Scarlet and Rob go to Trent’s to sell him jewelry but there are sheriff’s guards in the market and Scar barely escapes. She gets a feeling that someone is following her especially now that they know she’s a girl. With only one day left for the band to fence the jewelry before tax day, Rob appoints the help of townies so that they can go off to other towns and sell the jewelry. Scarlet is to go to Leicester with Thom Walker who ends up slowing Scar down when she spots Gisbourne’s men and runs before they can spot her. She gets a feeling that Gisbourne is tracking her but the band think it’s unlikely and that she’s being too suspicious. At night, Rob and Scarlet goes to Edwinstowe and start on opposite end to hand coins to the families. Scarlet’s barely halfway done when Thom arrives, knocks her to the ground, and gets on top of her. He tells her that Gisbourne will be here soon and he’s just there to stall her. Scarlet screams for Rob and knocks off Thom to stand and just then Girbourne arrives. He tells her he knew it was her when Thom mentioned her moon-colored eyes and calls her her fiancé. He’s about to take ahold of her when Rob yanks on her arm from behind and they run away. Rob orders Scarlet to go to Tuck’s and goes to warn the others about Thom. John comes to her hideout at Tuck’s. They embrace and kiss which Rob comes to get her and sees them kissing which makes him furiously jealous. Downstairs the body of Thom has been badly mutilated and on his chest are the ‘Give me Marian’ written with blood. Later Scarlet tells Rob everything about her life. How her parents were desperate for money that they agreed to Gisbourne’s proposal and how her sister and she ran away from home to escape their fate. She expects Rob to give her over to Gisbourne but Rob is against that and is angry about the fact that she’s engaged. Scarlet comes to a decision that she’ll go once the twenty-seven people sheriff caught are free. They have four days before the sheriff marries and hangs the prisoners the next day. Ravenna gets them the map of the prison as its location has been changed. The band goes to Nottingham Castle dressed as monks and scan the place. They plan to go to prison the night before the wedding. At the prison they get everyone out through the tunnel except one and that’s when Gisbournce catches Scarlet from her hood but she cuts of her hood along with her hair and gets past him to the tunnels. However, she sees Rob cresting the stairs with a badly injured man. Gisbourne sees the opening but Scar heaves him away from Rob in three steps. Gisbourne catches her by her throat and squeezes. Rob comes to her rescue and tells her to go to the tunnel to handle the guard who made it in there. Scar makes to the tunnel and it’s too late by the time she realizes that Rob lied to save her and has been taken as a prisoner. John holds her off but Scar spots the spout draining water out from the castle and slides into it. She hears Rob’s voice and from where the tunnel opens a bit beneath the prison, she could see firelight and the shadow of the torturer. Scarlet shrieks for Rob but it’s an exercise in futility so she comes back. The wedding is next day and the band intends to tumble a part of the castle to cause distraction when the it’s happening and Scar makes an offer to trade herself for Robin, so that they can rescue him and run away. However, Robin is in a heavy gibbet of iron swinging from heavy chains about the dais in the church. It’s clear to Scarlet that it’ll be nearly impossible to free him with so many guards swarming the place. Sheriff is married to Ravenna and right after the ceremony, the guards surround the dais and the sheriff slits Ravenna throat as he knows she was passing information. Then comes the time to hang Robin whose has beem badly tortured with his back punctured with small holes. Rob is ordered of the cage so that he can kneel when Scarlet yells comes through. She offers herself in marriage to Gisbourne if he lets Robin and Godfrey go free. Robin asks her to run and Scarlet says it won’t work. He tells her that she’s his heart and it’s breaking it. Then he goes out of the church. Scarlet and Gisbourne are married. Scarlet tries to pull away and trips over Ravenna’s body but Gisbourne catches her and draws a new gash on the old one on her left cheek. The whole place rocks with an explosion and Gisbourne drops her. Scarlet climbs up the chain on the gibbet. Just then John comes and knocks Gisbourne’s sword away. He grabs Gisbourne’s sword and is about to strike and stops. The sheriff comes from behind with his sword and is swept sideways. Someone holds his chin and that’s when James Mason slits his throat, avenging his daughter. Gisbourne and John resume fighting. In the middle of the epic showdown, Scarlet takes off. She runs straight to Robin and they tackle hug. John arrives and informs that Gisbourne has run away. With no sheriff, everything is in chaos and this means that they have some time to figure what to do before Gisbourne comes back for Scarlet. Scarlet leads Robin into the cave to tend to his wounds. When she comes out for supplies, she asks John what happened back there and he confesses that he halted killing Gisbourne because he knew that he’d lose Scarlet to Robin forever. Scarlet is angry but upon seeing Rob, her thoughts are only about him. Outside, the band takes off farther into the forest. Scarlet sets to work on cleaning Rob’s wounds and asks him what he meant. He tells her that he loves her and she has his heart is she isn’t with John. Scarlet is shy but kisses Rob on the cheek anyway. They lie down in each other’s arms. Despite being married and on the run, Scarlet finally feels safe and free. Thief Taker – Someone who captures criminals for a living, is usually hired by victims, and likely to be corrupt in their dealings.